Here we want to fill pdf form already build with adobe acrobat pro with data stored in our database. I believe that your "PDF Form Filler OCX" can do the job. I have a data source in MySQL and want to fill some PDF through functions and routine (in VB or other). Is the "PDF Form Filler OCX" is the best option for us?? I try to download the trial but the OCX does not register properly. Can you assist me to find out what solution is the best for us? Yes, "PDF Form Filler OCX" is the best option for you. You can retrieve data from database and save to FDF or XML format first, and import this FDF/XML and fillable PDF file into "PDF Form Filler OCX", then you can combine data into PDF file programmatically. In the "PDF Form Filler OCX", user can modify and edit data in form fields, and then click "Save As..." or "Save to Disk" button to save to a new PDF file, the new PDF file will contain filled data values. The user can also click "Export Data" button to a new FDF or XML file, you can parse data from FDF or XML and insert them into MySQL database again. Fill-in and save interactive PDF forms to your computer for easy archiving, E-mailing or later printing. Allows you to Fill, Edit or Delete PDF field values. You can also Import or Export form data into FDF/XML/XFDF files. AutoFill, Batch Command and Spell Checker Tools are for the filling convenience. 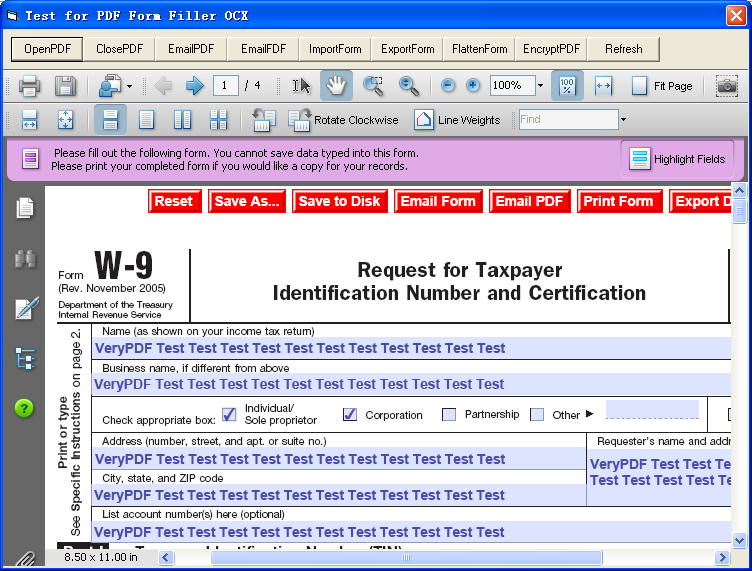 VeryPDF PDF Form Filler can be used to save interactive Portable Document Format (PDF) electronic forms to your computer to fill in and print at your convenience, send the completed forms via e-mail, and apply 128-bit encryption or password protection to your PDF documents. Note: If your PDF form does not have interactive form fields on it, you will need PDF Editor software to add annotations. This entry was posted in PDF Form Filler and tagged pdf database, pdf form filler, PDF Form Filler OCX, PDF forms. Bookmark the permalink.